Part Of The "Advertiser's Caravan"
Paris, July 23, 2006 - I'm glad we were in Paris this past January, because the schedule Sue's company had us on didn't leave us much time for sightseeing on our own. The first day of our trip we met our friend karinebou for lunch, and the last day we climbed up to the top of Sacré-Coeur de Montmartre, and late one night we walked to the Eiffel Tower, but much the rest of the time was taken up with work events. Not that I'm complaining; the bike tour was great, we had fantastic dinners (and plenty of wine) late into every evening (which never seemed late because at this time of year the sun sets about an hour and a half later than here in New York. It's still light in Paris at 10pm! ), and there was often a group heading off to a club after dinner (I only joined them once, Sue not at all) - all on the company's dime. Very generous of them! Being that we were there because of the Tour De France (OLN, one of Sue's networks, broadcasts the Tour in the U.S.), there were also daily Tour-related events. 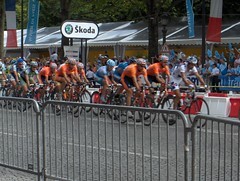 I now know more about bicycle racing than I ever thought I would know. Most days we gathered at a bar or conference room to watch the race on a big-screen TV. 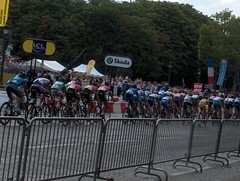 And on Sunday we had a fantastic lunch, then gathered in a special bleacher section on the Champs Elysées right near the finish line to watch the final stage. It was a pretty awesome place to watch - the bicyclists start about 50km or so outside Paris, bike into the city, then make eight 6km loops through Paris, meaning we got to watch them go by sixteen times. 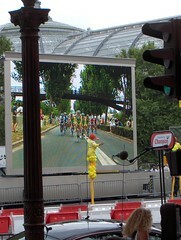 Plus we got to see the whole thing on a jumbotron conveniently set up near us. It's pretty impressive - not just the speed of the bikers, but how close they all are to one another. And not only that, but how close the support cars and motorcycles are to everything. There seem to be many opportunities for injury and death; you have to be on drugs to want to do that. Before the bikers get to the city, we were treated to the "advertiser's caravan". Think of the Oscar Mayer Weinermobile. Now imagine of a couple of dozen European companies who each have at least half a dozen cars done up like their own relevant versions of the Weinermobile - giant tires, giant pretzels, giant unidentifiable French company mascots. And proceeding not at a stately parade-float pace, but taking a couple of loops whizzing by at like 30-40 miles an hour. Very bizarre, but very much fun. Now if I were a real important client, I would have been able to take a couple laps in a support car, or perhaps I could have gone to one of the stages in the Alps (the first day we watched, the stage ended in the very town we were in this past New Year's! ), and watched the race from a helicopter. 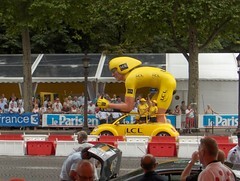 And then maybe I could have gone on the Team Discovery Channel boat ride down the Seine with Lance Armstrong and crew. But I didn't - I wasn't important enough. (I at least got a tour of the production trailer and we met the on-air announcers - former Tour competitors - at dinner one night.) Again, no complaining here - it was more than enough to be wined and dined and feted at all. Plus five-star hotel and business class plane tickets. It's astounding how much money is spent on this sort of thing. It's all coming out of my cable bill, I know. And yours. Thanks!